Physoderma brown spot and stalk rot is a relatively new corn disease in Iowa. 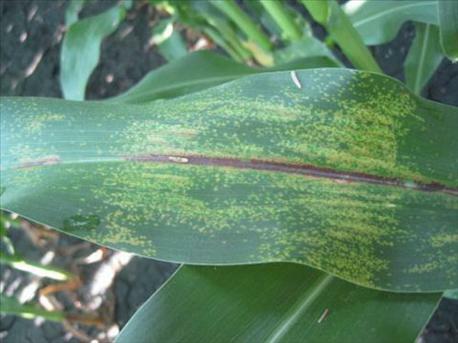 Farmers and crop scouts are being alerted to be on the lookout for Physoderma brown spot and stalk rot, a relatively new corn disease in Iowa. Physoderma brown spot and stalk rot is caused by the chytridiomycete Physoderma maydis, says Alison Robertson, Iowa State University Extension plant pathologist. This is the only class of fungi that produce zoospores. Those are spores that have a flagellum (tail) and swim in free water. Robertson provides the following information and description of symptoms to watch for. Figure 2: PBS infected nodes on the cornstalk are rotted and will snap easily when gently pushed. Physoderma maydis survives as sporangia for two to seven years in soil and crop debris. The sporangia are wind dispersed or splashed into the whorls of developing corn plants. When the whorls fill with water for an extended period of time, due to excessive rains or irrigation, the sporangia germinate and produce zoospores that swim and infect the meristematic tissue of the developing plants. Corn is most susceptible to infection between growth stages V5 to V9. Symptoms of Physoderma brown spot are very characteristic. Infected leaves have numerous very small (approximately 1/4 inch diameter) round or oval spots that are yellowish to brown and usually occur in broad bands across the leaf. (See accompanying photo, Figure 1). Dark purplish to black oval spots also occur on the midrib of the leaf, and may also occur on the stalk, leaf sheath and husks. Symptoms may be confused with eyespot, southern rust or purple leaf sheath, so look for the purplish oval spots. These purplish oval spots are filled with thousands of sporangia. Figure 1: These are the characteristic symptoms of Physoderma brown spot. These PBS symptoms can be confused with those of eyespot, southern rust and other corn diseases. Infection of nodes 6 and 7 may result in stalk rot. Physoderma stalk rot has been reported in Iowa for the past three years, predominantly in northern Iowa but there have been reports from southwest Iowa in 2013 and just last week the disease was reported in Lee County in southeast Iowa. Infected nodes on the cornstalk are rotted and snap easily when gently pushed (as shown in Figure 2), for example while walking across rows. Brown spot symptoms often are not visible on the leaves of plants affected with stalk rot. In fact, affected plants often look very healthy and have excellent yield potential. Some corn hybrids appear to be more susceptible to infection by P. maydis than others. Moreover, the very wet conditions that occurred during June across most of the state likely increased risk of disease. Many fungicides are labeled for Physoderma brown spot management, but there is no publicly available data on application timing. Research is underway to determine how fungicides could be used to manage the disease. "Physoderma cannot be controlled with a fungicide at this point in time in the growing season now that we are in late July and going into August," says Mark Johnson, an ISU Extension field agronomist in central Iowa. Infection occurred back at the V6 growth stage of corn, plus or minus, he notes. "If you see these symptoms," says Johnson, "understand these three things: fungicide application will not help, the disease probably will not cause a huge yield loss, and the stalks may be easily broken while walking through the field during late season scouting." In fact in severe cases, the stalk may not only be brittle at the lower node(s), but may be rotted somewhat in the pith, he says. This can cause harvest losses. "If you are experiencing a field or two with this disease this year, be sure to ask your seed corn supplier which hybrids have good resistance to PBS," advises Johnson.